Norman sat in the dock and listened to the Counsel for the Prosecution outlining the case against him. The whole situation still seemed totally unreal. How had it all happened? There are times in life when you need a distraction. For our narrator, that meant immersing herself in a novel she had written over twenty years before. 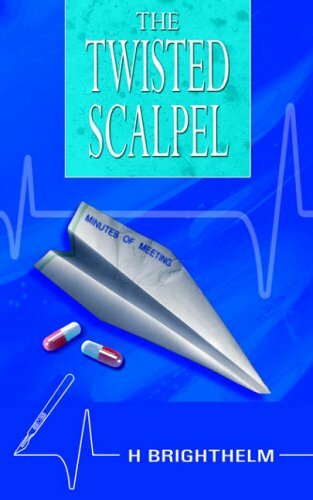 The Twisted Scalpel is the darkly humorous story of Norman, an idealistic and naive young man, working in the Chemical Pathology lab of an East End hospital. Taken back into a different era, she finds herself caught up in the story - almost as caught up as Norman, as events around him spiral out of control. H Brighthelm is enjoying retirement after forty years in medical research, largely within laboratories in the National Health Service. Thanks are due to many colleagues for a prolonged and varied working life. They also provided friendship and entertainment along the way. H Brighthelm is enjoying retirement after forty years in medical research, largely within laboratories in the National Health Service. Thanks are due to many colleagues for a prolonged and varied working life. They also provided friendship and entertainment along the way.